Centro Isaac Campantón: Call for Papers "Zamora in the Jewish Sephardic Memory"
Call for Papers "Zamora in the Jewish Sephardic Memory"
Center Isaac Campantón welcomes submissions for its 5th International Conference, taking place on July 3 at Hotel NH Palacio del Duero. 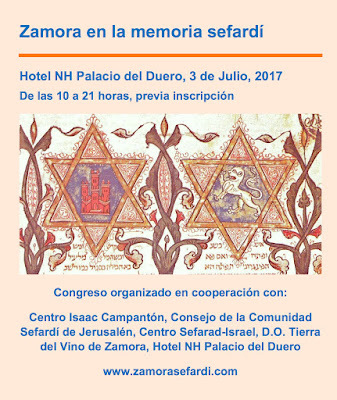 Common theme for this year is “Zamora in the Sephardic memory”. The goal of this conference is to foster scholarly conversations on the Jewish legacy of the city in connections with the diaspora from 1492 to the present. Proposals should be submitted to centrocampanton@gmail.com and they should include: name and last name, institutional affiliation – independent scholars are also considered-, an abstract of 250 words, email, phone, and technological needs for the presentation (computer, projector, audio). Deadline: May 27, 2017. Proposals will be immediate evaluated and the academic committee can recommend improvements of the abstracts before full approval.